You have to work to locate artist Charles Burwell—by stepping gingerly across a junk-strewn lot, pushing open an institutional pink door, pulling open an imposing set of black doors, skipping up a few makeshift wooden stairs, and then walking through the final entrance into his 2,700-squarefoot Kensington studio. Getting to the heart of Burwell’s paintings isn’t easy, either. “A lot of my work has something to do with not being able to push your way through,” he says. 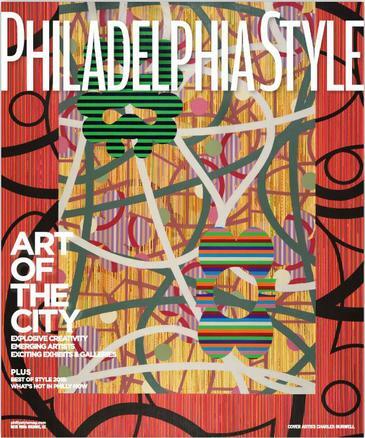 “And there’s certainly a connection to my living and working in Philadelphia with all of its visual complexity. I’ve always been interested in early modernists whose work reflected that kind of urban energy.” A particular favorite, he says, is Fernand Léger’s The City at the Philadelphia Museum of Art. A faint aroma of stale smoke hangs in the air, and African music plays softly in the background. Burwell, 60, crouches near the bottom of an enormous canvas, meticulously painting black squiggles. Crimson is the dominant shade of this abstract, but the original background has been subsequently overlaid with amorphic shapes striated by tones of emerald and olive, navy and lavender; elsewhere, crystalline spheres of teal and peridot bounce through a swirling trail of aubergine. The effect is that of a Pollock meeting a Matisse cutout, with sprinklings of styles like Color Field, Op Art, and Pop Art. Its precise chaos is all Burwell, though, a distinctive mélange of lines, drips, and geometric forms that are often inspired by the organic shapes found in nature. Or not. When a viewer points toward one blob and says it resembles Snoopy, Burwell offers a different cartoon figure: Tweety. He started working on this latest piece, called Red Frequency, last year, using, as a jumping-off point, what seems to be all available hues of the color red. Eventually, it will have more than a dozen layers. “I’m not sure how I define ‘complete,’” he says. “At a certain point, it offers a feeling of completeness, that’s all. Lately, I’ve been leaning toward an excess of information, so the paintings are getting more complex.” It “takes a certain kind of personality to live with that intensity,” Burwell adds, allowing a touch of wryness to enter his otherwise measured tones. But complete it he must, since this particular work will be installed at the Delaware Center for the Contemporary Arts in Wilmington, where it will serve as a focal point for an exhibit called “Layering Constructs” (on view through September 7). In addition to Burwell, the show is displaying works by Margo Allman and Antonio Puri, two other abstract artists who use layering; a joint exhibit will be presented concurrently at the Delaware Art Museum (through August 2). Thanks to the increasing complexity of his work, the hometown artist is enjoying a recent breakout in his career. Burwell is selling more and more outside of Philly, is having his shows reviewed in the art world’s leading publications, and is contributing to major exhibitions, including a recent run in a traveling show at the renowned McNay Art Museum, in San Antonio, Texas, and the Akron Art Museum, in Ohio. “Charles has had an incredible two years,” says Bridgette Mayer, owner of the eponymous Bridgette Mayer Gallery, on Washington Square, who represents Burwell locally. “Collectors love Charles for his use of color and the intricacy of his processes.” Indeed, Burwell has begun to attract collectors’ eyes so much that Mayer featured his work in her gallery’s booth at the Art Miami art fair, which runs during Art Basel Miami Beach, this past December. It was the fifth consecutive year the artist’s work had traveled south for the winter. The drips, however, are subtle. What emerges as Burwell’s true signature is his ongoing exploration of geometric shapes. Over the years, he has created hundreds and hundreds of templates, first by hand and in the last decade or so by computer. “It’s sort of a vocabulary I’ve developed,” he says. There are straight-on circles, ovals, and geodes, but also more amorphous forms that look like clouds, thought balloons, toy jacks, jigsaw puzzle pieces, or teddy bears. Once Burwell or an assistant traces a template onto the canvas, it’s time to painstakingly fill it in. It’s here that Burwell’s fondness for stripes, dots, grids, diamonds, and plaids is given life. It sounds like a mad jumble, but each work is tightly constructed and symmetrical—there is never any sense of sloppiness or of something missing.